There's no question that San Francisco is a beautiful city. People visit the bay area from all over the world to delight in its charm and not to mention delicious food. While it is no secret that the city is incredibly photogenic in the daylight, I will argue that San Francisco is equally as beautiful at night. I met with an intimate group of seven photographers just across the bay from San Francisco in the quint hills of Marin. To kick things off I introduced myself to the group and then we went around in a circle so we could get to know one another. After orientation, we piled into the Aperture Academy van and headed across the Golden Gate Bridge and into San Francisco. The first stop on our itinerary was The Palace Of Fine Arts. This greek inspired building is an absolute work of art and is a must for anyone who is visiting the city. The pond in front of the building creates a perfect reflection making this building one of my favorite structures to photograph in the city. Once everyone had their gear setup, I rattled off some initial settings for the group to use but encouraged the group to make adjustments when needed. Once the shutters started rolling I walked around to check in with the photographers to see how they were doing and answer any questions that had arisen. After everyone got comfortable shooting in the dark we packed up and headed deeper into the city to the famous switchbacks of Lombard Street. First we shot from the top of the hill and then worked our way down the street. This is always a fun spot to experiment with the light streaks that are caused by the vehicles driving down the road. The next location was The Bay Bridge. This bridge was built in 1936 and is truly a marvel of its time. It also happens to make for a pretty good subject at night since every suspension cable running down the bridge has a strip of white lights on it. The Bay Bridge is actually the world's largest LED art installation! 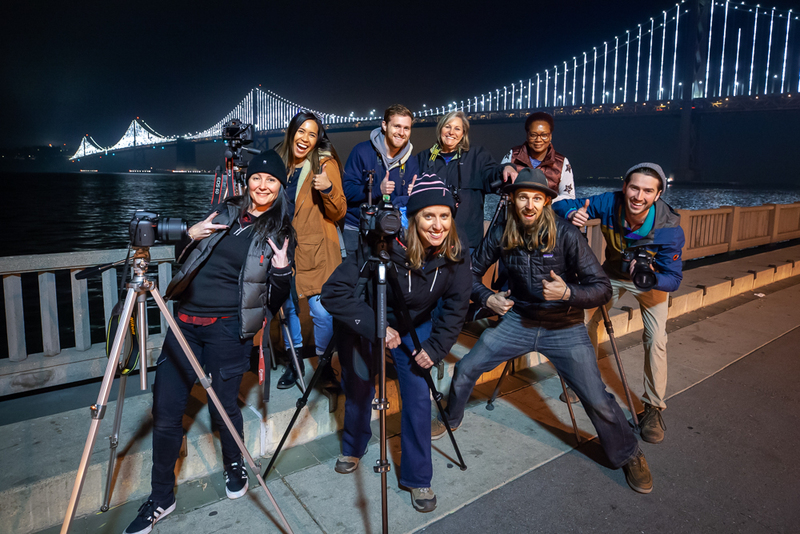 The group had a blast shooting the bridge and concrete pillars that rise from the bay. By this point the night was getting late and we still had one more spot on the shoot list so we piled into the van and drove back across the Golden Gate Bridge to Fort Baker. Fort Baker is a little less know location in the bay area and has a unique vantage point from below the bridge. At this location I had folks experiment with different white balances to see how they affected the golden glow produced by the sodium vapor street lights. Before we knew it, the clock struck twelve and it was time to call it a wrap. I drove everyone back to Marin City where we said our goodbyes and parted ways.